Although silver does not get much love lately, there are silver plays around that could move significantly as soon as the price of the metal recovers in more positive precious metals sentiment. One of these plays is Golden Arrow Resources Corp. (GRG:TSX.V; G6A:FSE; GARWF:OTCQB). Despite the name, this junior doesn't own one NI-43-101 compliant ounce of gold in the ground yet. 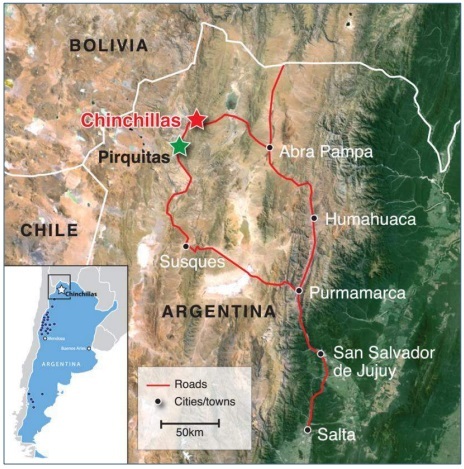 Its flagship project is called Chinchillas, located in the Jujuy province in Argentina, and is a large, open pit silver/lead/zinc project. At the moment it is on the brink of production, as part of the Puna Operation, a joint venture (JV) with much larger gold/silver producer SSR Mining (SSRM.TO, market cap of C$1.6B, formerly known as Silver Standard). The Chinchillas deposit has been turned into an open pit mine recently, and production is ramping up towards nameplate capacity. The ore is being delivered to the nearby Pirquitas processing plant, as the Pirquitas silver mine, previously owned by SSR Mining itself, was depleted this year. SSR Mining has financed this whole operation, and Golden Arrow can sit back front row after paying back its 25% share of capex, and watch the show unfolding while being paid. As Golden Arrow gets 25% of after-tax net cash flow generated by Pirquitas, this is not much at this stage and silver price, but as soon as full production is reached by the end of this year and especially as the silver price starts rising again, the share price will probably see a strong re-rating. To get an indication of the upside potential, and other ins and outs of Golden Arrow, let us take a closer look. Golden Arrow Resources is an exploration and development company operating in Argentina, and member of the mining investment firm called Grosso Group, founded by Joe Grosso, who already pioneered successfully in mining for over two decades in Argentina. The Grosso Group made four major discoveries during that period: Gualcamayo, Navidad, Chinchillas and Amarillo Grande. The flagship project of Golden Arrow is the 25/75% Puna JV with operator SSR Mining, based on the Chinchillas deposit and the Pirquitas Mine, 45 kilometers away, which until very recently was one of the largest primary silver mines in the world, in the Jujuy province. Both companies have a long history in this area, which probably has been beneficial for operations. Besides the Puna project, Golden Arrow also owns several gold/silver/copper exploration projects in Argentina and recently acquired the advanced Atlantida and Indiana copper-gold projects in Chile. These advanced exploration projects are united in a subsidiary called New Golden Explorations, and the plan is to acquire more projects, and spin this out from Golden Arrow in the early part of next year. Golden Arrow Resources has C$5 million in cash at the moment according to management/financial statements, and no long-term (LT) debt. The company recently (July 6, 2018 per MD&A) arranged a US$10 million credit facility with JV partner SSR Mining, confined to Puna capex obligations, with an interest rate of US Base rate plus 10% and a final maturity date of December 31, 2020. This short period explains the relatively high interest rate, but raising it through equity would have caused a lot of dilution anyway, so this way it can proceed with funding its part of capex. The loan is secured by the 25% ownership of Golden Arrow in Puna Operations. Management, Board, insiders, friends and family control about 50% of shares, which is good to see, and JV partner SSR Mining holds about 5% of outstanding shares. There are 4.5 million warrants, with an average exercise price of C$0.70, and 9 million options with an average exercise price of C$0.53.